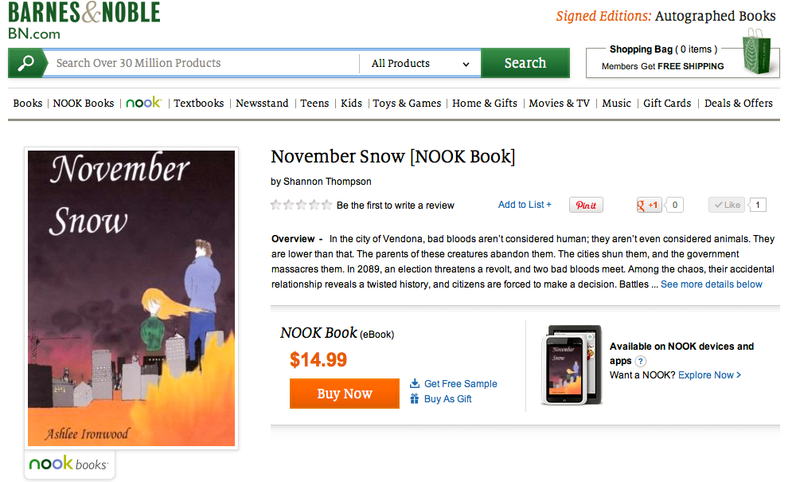 November Snow (NOOK Book) is now available on Barnes & Noble. 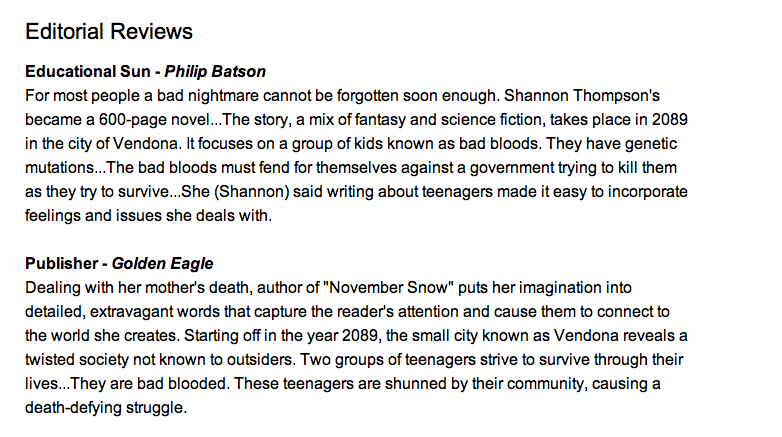 I’m really excited and happy about this, because November Snow (Paperback) will also be available through them in the next two months. So look out for that. Once that happens, I’m working at doing local events within their community, so I’ll be posting about those as they come. I hope everyone’s Sunday is fantastic, and don’t forget to come by the Undergraduate Reading Series this Wednesday if you’re in Kansas! Since I know most of you don’t live in Kansas, I’ll be sure to post what I read when that evening comes. A blogging peep has some happy and exciting news! Check it out! Shannon, congratulations on being a writer, I hope to publish a novel soon. Will be reading your site! Congratulations! You must be ecstatic! Congratulations on your success. You’re on your way. What a huge accomplishment – congratulations! That’s really exciting! I have one book that I’m currently reading, but after that, I need more good books to read. I just saw that it’s not available for Kindle, aw! I’ll have to wait until I move to Germany to pick it up, then. Unfortunately, Amazon Kindle wouldn’t allow me to keep my contract if I signed with Barnes & Noble, so Amazon will continue to sell my paperback, but Kindle is no longer available. Ohh, that stinks! I guess I’ll have to read it regardless of gym time. That’s my treat to myself for working out, getting to read books on my phone that has Kindle, lol. Wow, congrats! That’s huge – well done!